You’re not going to win many games in which your starting pitcher goes less than four innings. On the other hand, you’re probably not going to lose many games in which Bobby Wilson hits a home run. 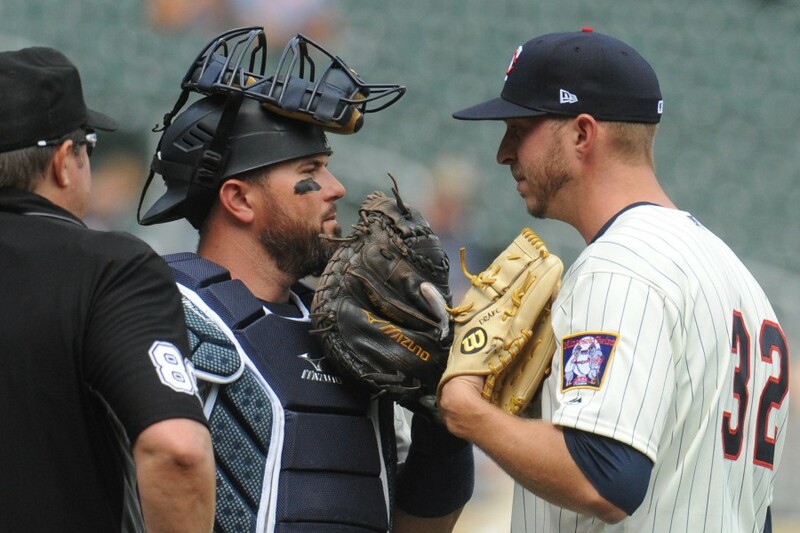 Both of those things happened in Wednesday afternoon’s game, but it was the Twins’ bullpen that really turned in the performance that mattered. This was Berrios’ second-shortest outing of the year, but the third time in his last five starts he failed to complete five innings. It took him 86 pitches just to record 11 outs. He gave up seven hits, walked two batters and hit another. To make matters worse for Berrios, the defense committed two errors behind him. 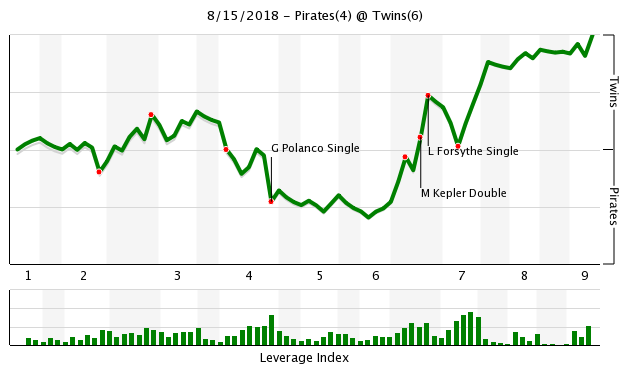 Jorge Polanco skipped a throw that first baseman Ehire Adrianza couldn’t scoop, resulting in a run, and Eddie Rosario, playing right field for the second-straight game, couldn’t cleanly field a single. The Twins managed to get to Chris Archer, taking a 5-4 lead in the bottom of the sixth inning, and the new-look Twins bullpen stood strong. Oliver Drake kept things clean for 1 1/3 innings. He’s now up to 4 1/3 shutout innings since joining the Twins. Gabriel Moya gave up singles to three of the seven batters he faced, but thanks to Tyler Duffey, he also ended the day with 1 1/3 scoreless innings. Since being called back up in late July, Moya has given up three earned runs over 11 2/3 innings (2.31 ERA). Going back to Duffey, he took over with runners on first and second and one out in the seventh. A huge spot with the Twins clinging to a one-run lead. He got the next two batters to fly out, ending the threat. Since his return, Duffey has now thrown 3-1/3 no-hit innings. A couple more familiar faces took over from there, as Taylor Rogers handled the eighth before Trevor Hildenberger got the job done in the ninth for his third save. Altogether, the bullpen combined for 5 1/3 innings of shutout ball, giving up five hits and two walks while striking out four batters. Logan Forsythe was 2-for-3 with a walk and three RBIs. He’s gone 17-for-44 (.386) since joining the Twins. Bobby Wilson had an RBI single in the second inning, then added a solo homer in the seventh. Karma. Three different Twins relievers have thrown 40 plus pitches (and a 4th with 37) since the last time Trevor May threw 1. Different names. Same idiotic usage. There's a couple of quality wins right there.Let's change the culture. Bobby Wilson and Logan Forsythe carried the team to a win... Yay? Maybe there is a reason May hasn’t pitched. Arm troubles, or maybe having some discomfort. Think most of us want to see him pitching more. And so does Molitor. Then he should probably be on the DL. Bobby Wilson -- what more can be said? Well done! Women want to be like him. Men want to have his baby. So what’s wrong with Berrios? To be honest I think he can pitch better than this? Does he have a dead arm? Is he off mentally after his Cleveland start? I don’t want to be disappointed in the kid, I just wish he’d pitch better rather than falling in these ruts. Another reason MOY shouldn’t be manager next year, Adrianza starting at 1st. Austin and Garver on the bench. This is swell! Just swell! These young not old fellas in the bullpen are stepping up to the plate toeing the rubber and getting her done. That is, if the game of baseball has a gender. If not, then they are getting it done. Either way, I think this is just tops. The cat's meow. Pittsburgh's FO zigged where the Twins' zagged, and look who came out on top in this scrum! Memo to Molly--and this is coming from a live-by-the-seat-of-your-pants type of guy--Look out a couple of days ahead and try and give a guy like Mauer a day off from the field on days when...blah blah...so you don't end up with Ehire...nevermind. Keep zagging. Seeing Duffey pitch well and having Moya be decent... good thing we had Belisle pitch so many innings, right? I'd throw May's name in there but I guess he's the new Magill. Maybe there is a reason May hasn’t pitched. Arm troubles, or maybe having some discomfort. Think most of us want to see him pitching more. Yup. Touch of the flu, actually. They have stated they will be careful with May’s use. That is a tough mix with the need to get him in front of major league batters. They do have enough arms in the pen to manage his more limited use. Makes sense to wait for official word before biting the manager's head off and throwing him under the bus.Feel better tomorrow Trevor. A couple starts in a row pitching less than 5 innings for Berrios... Hope he breaks out of the funk. Actually, Thorpe was called up yesterday and pitched for Rochester today at noon, I think taking Stewart’s place in the rotation. Actually, Thorpe was called up yesterday and pitched for Rochester today, I think taking Stewart’s place in the rotation. Thorpe was promoted? Good for him. After all those injuries, the guy is still only 22 years old and now in AAA. Pretty amazing. I'm still a Thorpe believer. Especially since he has well exceeded his career high in innings pitched. His career high in innings pitched was 83 which he did last year, so far he has pitched 114 1/3 innings this year and looks stronger now than when he started the season! I think Thorpe still has some ceiling in his potential. #2] I can't dislike Wilson because his work behind the plate is solid, and while I haven't checked recently, his RBI were almost in line with his actual hits. But come on, Garver has a future and Wilson doesn't. Still, it seems Garver has been getting more time lately, and that's important. #3] Berrios is too good to be worried about. Virtually every pitcher goes through stretches. #4] Moya has looked pretty good since his recent promotion. SSS? Maybe. Or maybe growth and opportunity are meeting? Think about Hildenberger last season. All the more begs the question about "where is Busentiz, Curtiss and Reed? #5] Drake is the flier you bring in on a milb contract with an invite. Like Magill. You might get lucky. You don't let him block anyone or keep him on the 40 man. #6] Hadn't heard about a bug bothering May, but makes sense if that happened. Regardless, no matter what he's shown...which has been very good and looked very good while in Rochester...he is still on the proverbial "come back trail" and should be handled a bit gingerly. Interesting that he actually told the Twins he should be in the pen in Rochester as he felt better and more productive there considering stamina and time off. #7] I like Mejia. Disappointed in his injury. I think his stuff plays as a solid SP. Just needs to learn how to put guys away quicker. I think his stuff could, potentially, play up even better in the pen. I believe he's out of options. He will be with the club next season in the pen, if not the rotation. Personally, been a huge fan of Gonsalves since the day he was drafted and thought we got a steal! Every single year, at every single level, he has performed and performed well. Usually, not surprisingly, he has struggled a bit on initial introduction, worked and developed, and then excelled. I expect the same thing to happen at the ML level. Decent FB from a lanky LH. Great change. By all reports, his breaking pitches are starting to work better and better. His BB have risen this season, but this too has been better lately. When does he get his feet wet because this wait is getting ridiculous. While I like Mejia, I think Gonsalves has an even better future in the rotation. And I think Thorpe, especially considering his age and lost time and what he's been doing, has an even higher ceiling than Gonsalves! Busenitz, Curtiss and Reed . . . sounds like a law practice. Kudos to Thorpe being promoted to Rochester; last night pitched a quality start but lost 3-2, 9 strikeouts 0 walks, not a bad start. Can I both dislike Logan Forsythe because he is not Brian Dozier, and like him because he is not Brian Dozier? Slated to toe the rubber tonite in the minors: Romero, Enns, Pineda, Enlow.